Hydrangeas wilting in the summer heat & don’t respond to watering? Check’m in the morning. Looking for pollinator plants and other ideas for your garden to bring bees, birds, butterflies and other beneficial fauna to your garden? Curious about what it takes to be a pollinator? Just want to create a gorgeous, year ’round interest garden that might just include pollinator plants? 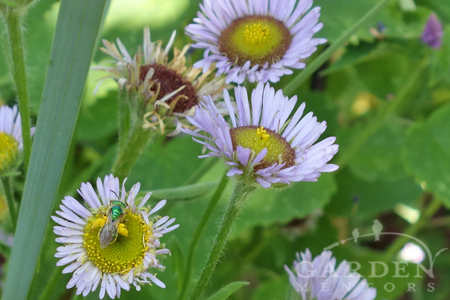 Pollinator plants like this pollen-rich fleabane attract wild Agapostemon sweat bees. We’ve got a number of ideas for you, and Robin will be sharing them in person on Saturday, February 21, 2015 at Seedy Saturday Victoria. And in her talk, get ready to learn about creating beautiful, functional gardens with color and interest throughout the year. Sure, she’ll talk about why and how to lure fauna to pollinate plants you eat, but she’ll also discuss great pollinator plants and other design elements that go beyond the vegetable garden. Can’t make it to BC for the seminar? Pick up one of these books or DIY pollinator habitats for your garden and get started with more than just pollinator plants in your garden. And, be sure to read up on our most popular posts about promoting pollinators, watch video of a corpse lily being pollinated in summer and throw the bees a lifeline by adding Bee Preserver garden art to your outdoor spaces.